Tai Chi Chuan (or Taijiquan) is one of the chinese internal martial arts. In addition to being a powerful martial art, it encompasses a comprehensive system for fitness and wellbeing based on hard and soft chi kung exercises, meditation and philosophical principles that go back thousands of years. As the popularity of Tai Chi has grown, so has the need for information on its concepts and methods. We hope that this web portal will help to promote Tai Chi and share information on all aspects of this ancient art. In time we will hope to include information on the history, principles and techniques of Tai Chi. All practitioners of Tai Chi will agree that it is only through the dedicated training in the basic techniques and their applications, that we can achieve a balance between our internal and physical selves. If you wish to contribute or let us know about any important news feel free to contact us. Image: Courtesy of Ronnie Robinson. 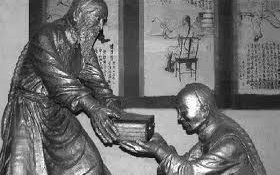 The image shows the founder of Yang style Tai Chi Chuan, Yang Lu Chan, receiving Tai Chi secrets from Chen Chang Xing. A journey shared gives purpose to every step!